Exercise your brain and immerse yourself in one of the world's most popular board games! 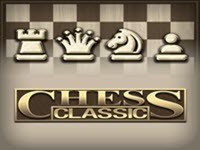 Play Chess Classic against the computer or your friends on the same device. Select between 6 difficulty levels for beginners and pros, customize your board and try to improve your skills! Are you up for the challenge? Use mouse to play this html5 chess game.